Do you find it annoying that when you get in your car, start it up, and music starts playing from your iPhone? It’s not the iPhone’s fault. Some songs in your iTunes library are louder than others. It’s not iTunes’ fault. And if you download public domain audiobooks and want to move them to iTunes’ Audiobooks library, well that’s easily done. Q: As soon as I start my car, the first song on my iPhone starts playing. I know a lot of people have this problem; how can I fix this? I happen to have recently bought (well, leased) a car with Bluetooth for the first time. I noticed that the same thing was happening; whenever I got in the car and started it, music would start playing. It’s not the first song, however, it’s whatever was playing last time I used the Music app, or another app that plays audio (such as a podcast app). I checked with the car dealer, and he explained that this was a feature, not a bug, and that I needed to turn off audio in the car each time I exit it to prevent it from playing music the next time I start it. In some cars, you can’t actually turn off audio, so you would need to switch to the radio to not play music from your iPhone. Some car audio systems may have an auto-play option that you can deactivate, but mine doesn’t. This is certainly an annoyance, but it’s not the iPhone’s fault. Q: I purchased two albums from the iTunes Store: The Velvet Underground & Nico and The Essential Lou Reed. 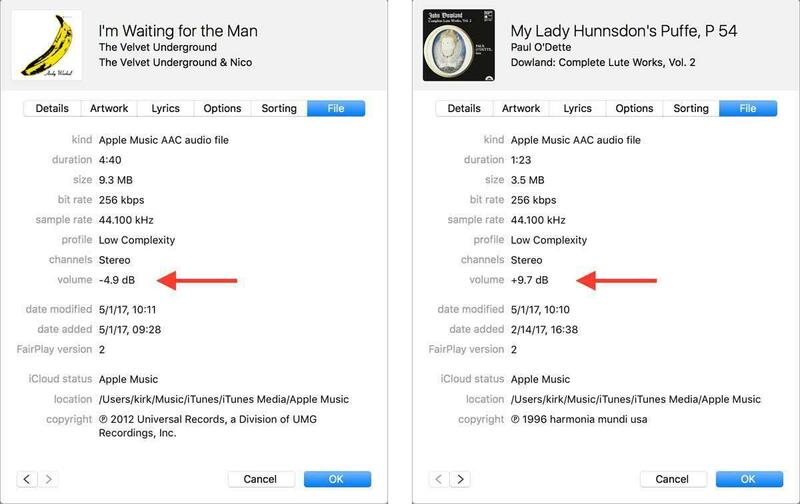 Each contains the song “I’m Waiting for the Man.” If I look at the metadata for each song, the volume is different; the Velvet Underground version shows a volume of -4.9 dB, and the Lou Reed album’s version shows -9.2 dB. The second song is much louder than the other. Is it possible to download versions of these songs where the volume is the same? If you select a file in iTunes, press Command-I, then click the File tab, you can see a bunch of metadata about that file. You can see the type of file, its size, its bit rate, and more. One element in that window is volume; this is the amount of volume adjustment that iTunes makes if you turn on Sound Check (iTunes: Preferences > Playback). As this correspondent noted, two versions of the same song have different volume adjustments; this means that one of them (the second version, with the higher negative volume adjustment) is louder than the first. They are the same song, but they were mastered at different times; the newer song was mastered at a louder volume than the older one. Audiophiles talk of the “loudness wars,” which began in the 1990s as producers and mastering engineers realized that if their songs were louder they’d stand out more. Because of this, many recent recordings are mastered that a level that eliminates much of the dynamic range (using audio compression), so the music is more or less uniformly loud. In this case, the quieter version of the song was remastered in 2003, and the louder version in 2012. Here are two tracks showing one with a negative volume adjustment and the other with a positive adjustment. These volume numbers that iTunes displays don’t matter at all in normal playback, but only affect the use of Sound Check. You will notice that the songs with higher negative decibel adjustments are louder, and those with positive adjustments are softer, but for most listening this isn’t a problem. But if you do make playlists mixing a lot of songs mastered at different times, with large differences in volume, you might want to use Sound Check to normalize these volumes. Q: I’ve downloaded a number of public domain audiobooks. When I add them to iTunes, they show as music files. How can I get them into the Audiobooks library? iTunes assumes that all audio files you add to your library are music files. In some cases, they are not, as you point out. 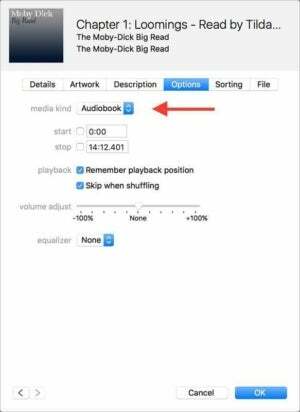 You may download audiobooks or podcasts, or you may even want to change some podcasts to audiobooks to be able to listen to them more easily. To do this, select one or more files, press Command-I, then click the Options tab. Click the Media Kind menu, then choose Audiobook. 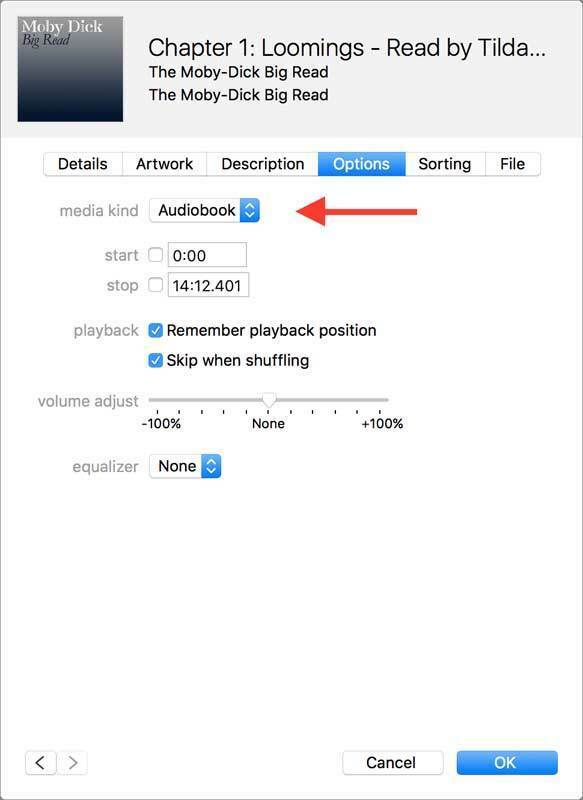 Click OK.
Change audio files of any kind to audiobooks. If you have audiobooks in multiple files, you may want to join them into longer files to make them easier to manage and listen to. I recommend Doug Adams’ Join Together, which can do this for you very quickly.